New Research Shows How To Stop Vampire Bats From Spreading Rabies : Goats and Soda Poisoning these thirsty critters doesn't work. But researchers think they're finally getting close to figuring out a plan. A vampire bat's fangs are so sharp that victims hardly notice when the animal slices through their skin and starts drinking blood. Vampire bats are thirsty creatures. And they drink only one beverage: mammalian blood. Each night, they hop on the ground, crawl up to an unsuspecting victim and latch onto its ankle. Then the little critters use razor-sharp incisors to slice a deep, tiny wound into a victim's skin. As blood flows out of the wound, the bat laps it up — about a tablespoon per bite. Most of the time, these bites are harmless — if not a bit uncomfortable. But if the bat carries rabies, a quick nip can be deadly. Vampire bats are the biggest cause of rabies in Latin America. Deep in the Amazon, rabid bat bites could kill as many as 1 percent of people in some villages each year. It's a serious problem for livestock as well. "Officially, rabies costs farmers about $30 to $50 million a year," says Daniel Streicker, an infectious disease ecologist at the University of Glasgow. "In Peru, it's the No. 1 disease reported in livestock and one of the things farmers are most worried about." And the problem is growing. "Previous studies indicate that rabies is spreading into new areas for the first time — or after a long period of absence," says Streicker. Now Streicker thinks he knows why — and possibly how to stop the virus. Using a series of ingenious genetic studies, Streicker and his team tracked the movement and social networks — which bat colonies are connected and intermingle — of hundreds of bats across South America. With the data, they could predict where rabies will likely cause problems in the next five years or so. The genetic data also offered another piece of vital information for stopping rabies: How the bats spread the virus. And for that, Streicker says, you can blame young, hot-to-trot males. Right after male bats go through puberty — at about a year old — they leave their roost and take to the sky. They're in search of a suitable mate, Streicker says. And they look for females far from their birthplace. Older males force them out of the roost, probably to keep them from mating with the older bats' females. 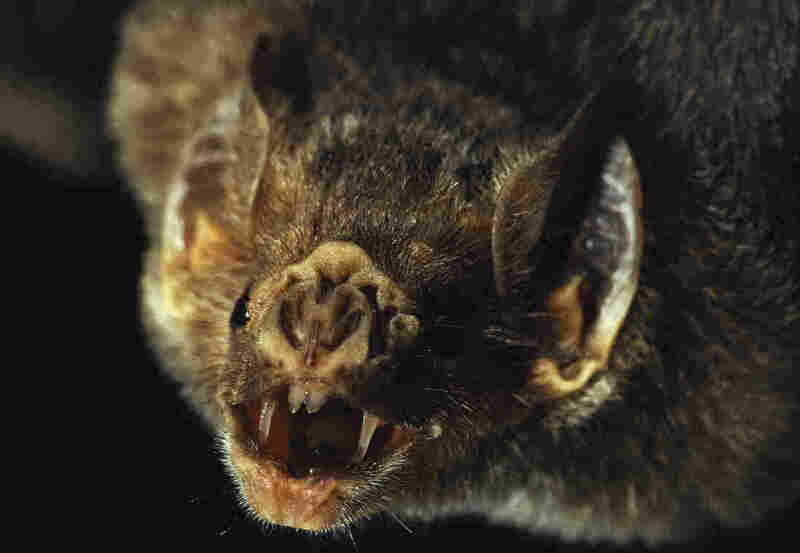 To figure out whether these jet-setting males could be spreading rabies, Streicker and his team sequenced three types of genes: those in rabies viruses found all across Latin America, genes found in both male and female bats, and a special set of genes passed onto offspring only from the mother, called mitochondrial DNA. The viral gene sequences showed Streicker how rabies has moved across Latin America, while the pattern of the regular bat genes shows how both male and females have moved. Vampire bats are the only bats that can run on all fours, and they do it by running on their thumbs! What about the special set of genes? That's key, Streicker says. "The geographic pattern of mitochondrial DNA indicates how female bats move along the landscape," Streicker says. And they were clearly homebodies. "The females were sedentary," he says. "They really just stayed where they were born." To see where the males were moving, he subtracted out the movements of the female bats from the movements of both the males and females. And what do you know: The movements of the males matched up with those of the rabies virus. Streicker and his team published the results Monday in the Proceedings of the National Academy of Sciences. The paper has gotten rave reviews. "This is excellent work," Gerald Carter, a vampire bat researcher at the Smithsonian Tropical Research Center in Panama, wrote in an email to NPR. "The findings could be vital for predicting and managing outbreaks of rabies." Because now scientists know that if they track the young male bats, they'll be able to figure out where rabies is most likely to spread next. 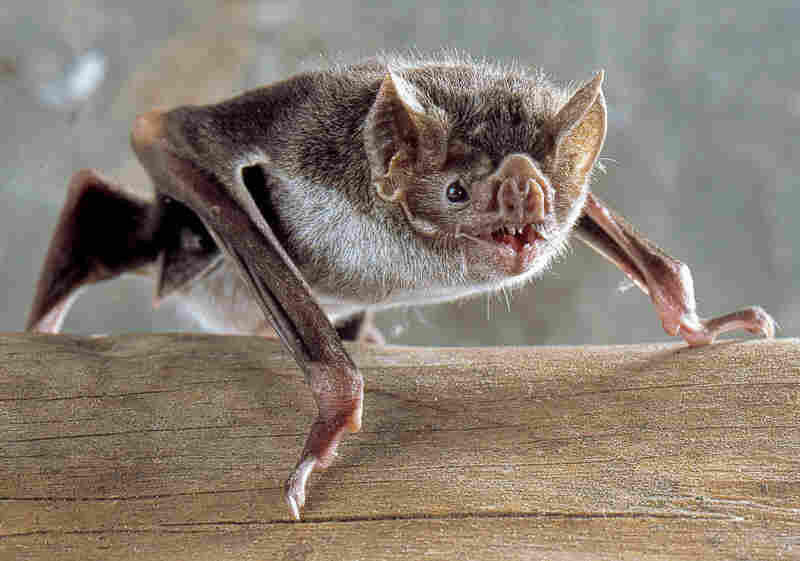 Right now, farmers try to stop outbreaks by killing vampire bats. They trap the bats and rub a pasty poison on their bodies. The animals then take the poison back to their roost and spread it to the whole family. "Ironically, randomly killing vampire bats [like this] might actually encourage dispersal by wandering males," Carter wrote. Researchers don't know why this may be the case, but increased dispersal could be accelerating the spread of rabies. That may be the reason farmers have failed to reduce rabies transmission in Latin America, he wrote. "Such unexpected discoveries illustrate why policymakers need these rigorous models and analyses of bat movements," Carter added. The findings also suggest a better way to manage outbreaks: Figure out where the virus is going to strike next and vaccinate the residents of the farms in the area — both the people and their animals.